The all-new EKOI STRIPE bib short has been made from 250g lycra, synonymous with softness, comfort, strength and optimal wicking. You may well even forget that you are wearing it it is so comfortable! 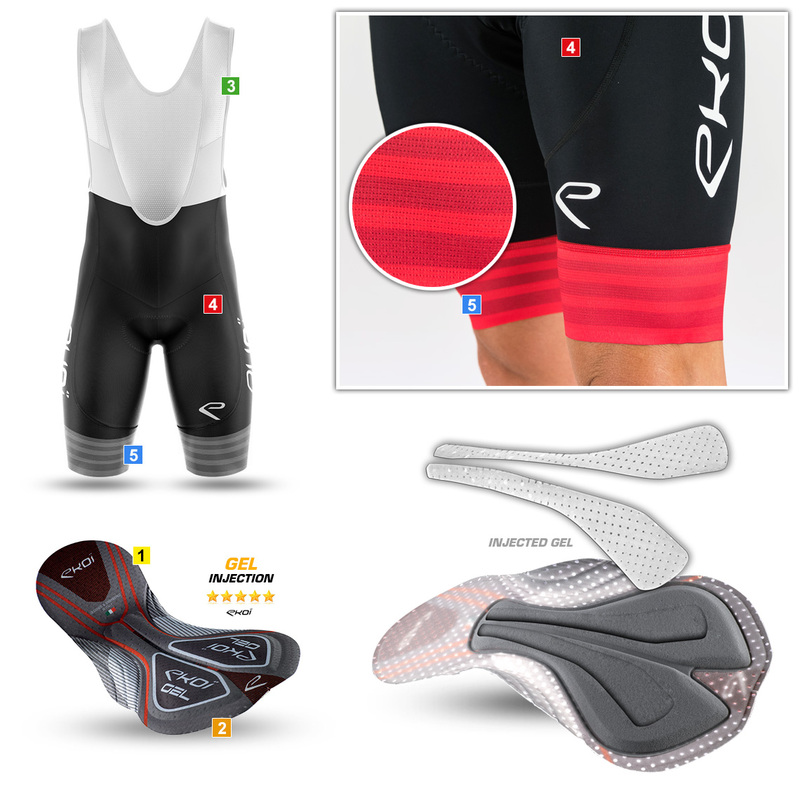 Every time you pull on the EKOI STRIPE bib short you will immediately feel the difference compared to other bib shorts, a significant sensation of quality, impeccable finishing and a product that adapts perfectly to your morphology, you won't want to ride wearing any other bib short! Try it, and adopt it! - Lycra with a second skin effect, it's so soft, but durable. - Perfect support throughout the pedal stroke. - INJECTED medical-grade GEL strategically-positioned in the area of the sit bones and perineum. - Injected gel neither creases nor loses its shape. - Stretchability (the pad adapts to the shape of your buttocks). - Optimal moisture transfer (the pad remains dry throughout your ride) because of the micro-perforations and the carbon thread that conducts moisture away from the pad surface and your skin. - Wide elasticated micro-perforated soft bands with silicone inserts for the perfect, strain-free support throughout the pedal stroke. - In stretchable and highly-breathable mesh for optimal tension-free comfort over the shoulders. Pad + lycra + elasticated thigh bands made in Italy.